I love where we live. Our little German town is the perfect location for travel, and our area in particular has some great things to brag about. Many towns in Germany have the many of the same amenities and is something I particularly love about Europe. In Germany there aren't suburbs like in the US, but rather small towns that are compact enough to fit most of your needs within a short walk or bike ride. 3. We have a wine cellar in our town. It’s called Charles’ Vinotheke and it is huge! Like most gems, it’s tucked away and I only found it because I happened to drive down this random street one day. Oh yeah, and that was a year after living here. This place has wines from all over the world and the owner is very helpful. He speaks English too! 4. We are near the airport. While some people may not like this or consider it a feature, I’ve grown accustomed to hearing the planes whiz over our house during the day. They’re not allowed to fly at night because it’s too noisy so it’s perfect. Also, when I want to go on a trip it’s only a 10 euro cab ride (or a few miles drive) to the airport. 5. Our neighbors are awesome. I haven’t talked about this too much but it’s true, I have amazing neighbors. They have parties, bbq’s, an annual neighborhood party, fires cooking homemade gluhwein in the winter and warm afternoon’s sitting on the benches with a beer in hand. They’re always so helpful and nice. I will miss them when we leave! 6. Everything is within walking distance. I walk out the front door and can easily get to everywhere I need to go. I will really miss this when we move back stateside. 7. We have an S-Bahn in our town. The S-Bahn is the train station and it makes trips to Stuttgart easy when we don't want to drive. 8. It's a common stereotype that Germans (this is generally speaking) are not the most outwardly friendly people. In our town, hoever, people are really friendly or should I say strangers are very friendly. My Stuttgart friends paint a very different picture but in my experience our German neighbors and others in our town are friendly. 9. We have the best ice cream shop in all of Germany. It’s true, we have a little Italian ice cream store on the main street that has the best ice cream I’ve ever had in my life. I think it was a huge selling point for my husband, he loves his ice cream. Since it’s run by Italians, they stay here for about 6-8 months of the year for the warmer weather, then when it starts to get cold they close up until springtime. I just saw a line last weekend so I should probably go get my fix. 10. We have an Asian food store. I love the random Asian food stores here. Ours is a Thai store and has all sorts of goodies that you wouldn’t find in the normal places here. They have coconut milk that’s just coconut milk and water which I love. Most coconut milk is filled with additives and things I don’t know how to pronounce. There are many specialty shops like this all over including Italian (how about truffle oil or real Italian noodles from Italy) or Indian (where you can get amazing spices! ), among others. 11. 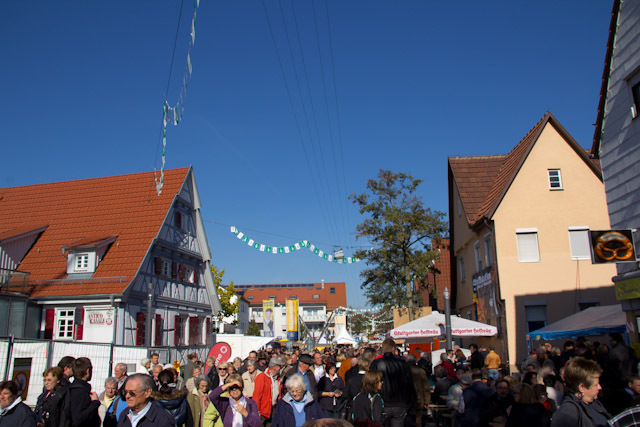 The celebration of the cabbage, Krautfest, is in our town. This festival is always so much fun and you can read more about it here and check out my Krautfest Gallery Here. 12. We have a place to take our dog. It’s called Dog Holiday (dogonholiday.de) and their rates are really reasonable. They walk her, she socializes with other dogs, and then she comes home and sleeps for days. Of course there are plenty of other reasons I like living here, such as a great amount of restaurants and things to do to keep you around for the weekend. It is still considered a smaller town so I think people that enjoy the liveliness of a city would find it quite dull. For me it's perfect. I prefer to live near a city, but I don't necessarily want to live in one!